Pellevé is the most significant advance in non-surgical skin tightening available. Are you tired of the appearance of wrinkles and fine lines on your face? Pellevé is an FDA approved non-invasive wrinkle removal and skin tightening procedure that provides a more contoured and youthful look. Pellevé is a radiofrequency device that precisely heats the deep layers of your skin using advanced radiowave technology without damaging the epidermis, or top layer. The heat causes the collagen in your skin to contract and tighten The heat energy created through the treatment stimulates the growth of new collagen over time, which results in firmer, tighter, younger-looking skin. The result is an improvement in skin quality, firmness and tightness you can see and feel. Pellevé can be used to rejuvenate the entire face and neck- anywhere there is loose skin or wrinkles. “Crows feet”: wrinkles on the side of eyes. 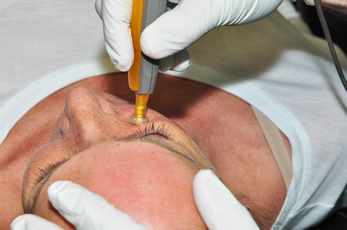 Before beginning the procedure, a protective gel will be applied on the face so that the radio frequency energy can go deep into the skin dermis. 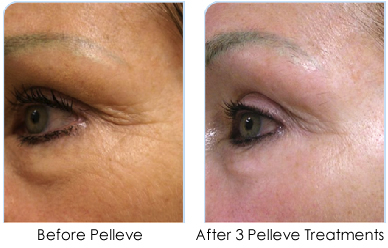 During this simple, non-invasive procedure, a special Pelleve hand piece will be used on the wrinkled skin. Every time this hand piece is used, a warming sensation may be felt. In fact, some patients say it feels like a warm facial massage. This sensation will fade after a few hours of completing the treatment. Is the Pellevé treatment painful? No, the Pellevé system requires no anesthesia or topical numbing. Most patients experience only a warming sensation on the skin when the Pellevé handpiece is applied. When will I begin to see the benefits of my Pellevé treatment? As a key benefit to the Pellevé treatment is that patients often experience immediate results and a reduction in the visibility of wrinkles at the treatment sites. Over the course of the next six months, you will continue to see smoother, more beautiful skin. How many Pellevé treatments will I need? 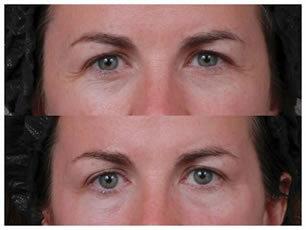 Many patients see an improvement in the tightness of their skin after one session with results improving over time. Multiple treatments are usually recommended for optimal improvement. Patients will continue to experience skin tightening after their session. A series of 3-6 treatments can prolong your results possibly to up to 18 months. Multiple treatments are recommended to help you achieve your aesthetic goals. The total number of treatments can vary between patient and is based on your individual skin needs. Any side effects to treatment are minimal and may include slight swelling or redness, which should dissipate within a few hours, but may last up to a day. What can I do to prepare for a Pellevé treatment? There is minimal preparation needed for this procedure; however, patients are strongly encouraged to drink plenty of water and stay out of the sun. Your appointment will approximately last one hour. Because Pellevé does not require anesthesia or downtime, it fits easily into your busy schedule. Anyone between ages 21 and 91 years old looking to non-invasively tighten the loose, sagging skin on their face and/or neck. Also, patients who have had a facelift in the past and are looking for a little more skin tightening or “tune-up” without having to have go under the knife again. Patients today are seeking affordable, non invasive alternatives to ablative and surgical procedures. The Pellevé System fills that void. The main advantage of Pellevé is the fact that its results last a full six months. Also, the treatment is quick and painless, and the results appear immediately. Pelleve has received clearance from the FDA for the non-invasive treatment of mild to moderate facial wrinkles for certain skin types. Call us today to set up your free consultation. We’ll see if you’re a good candidate for Pelleve and work with you to develop a treatment plan.